Thinking about it, a full graphics editor like Atari Graphics Studio would be nice but not necessary. What I really need is to import a .PNG file ad export it to FastBasic. Screen data export to file (all supported languages). The feature is accessible in Source code generator and File menu (item Export data as - which creates a file). 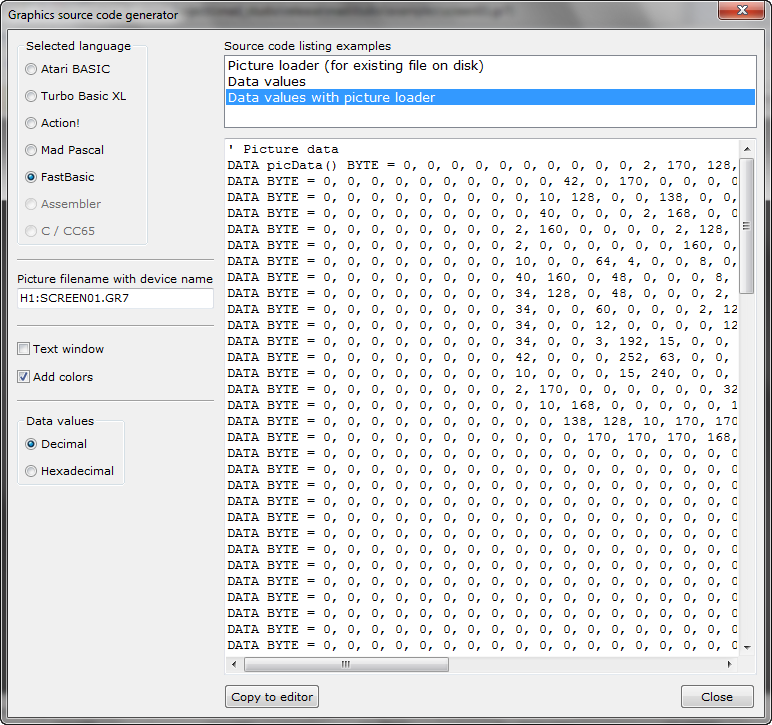 Also, you can automatically make data values with picture loader (exceptions are assembler and CC65). The GUI layout and usage of Graphics source code generator has changed (it is same as in Player Animator). Now it is easier to prepare code for selected language with less confusion. You can also choose between decimal and hexadecimal values. Please test and report back if it is what you wanted to be. Btw, other languages will be supported with your help. Either way they do not import into MAC/65, the latter gives "truncated records"
Looking at one of the Envsion exported M65 files with the (line numbered) .DATA statements they have $9bs also but they import ok! Perhaps adding the line numbes will work? p.s. Assembler format file should have two spaces before "dotBYTE" and no spaces between commas. If you do add the line numbers then the cut and paste into MAC/65 on altirra method may also work. Edited by therealbountybob, Sat Mar 9, 2019 5:41 AM. I will look at Envision source code output options. It seems it would be better to add also MAC/65 and similar (native assembler) to the list of languages for data listings, because line endings differ from those in cross-compiler languages like Mad Pascal or MADS, of course. 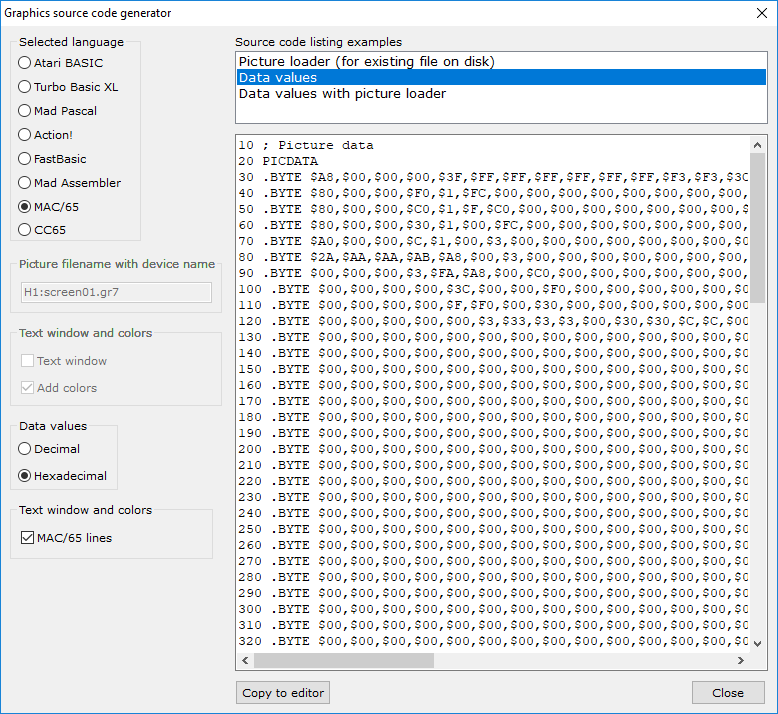 The same problem exists for listed Atari BASIC output files, so this has to be fixed in next version, too. I will fix spaces between commas, my mistake. I must confess I didn't mind the missing space before .BYTE declaration in MAC/65 source code dialect. Another reason for splitting assembler output code for native and cross-compiler types. Thank you, Kaz! I am glad it will be of some use for you. I have to make better friendship with the time to balance on-going life and Atari time. First I have to fix current bugs and move to new features. Just drop a note for anything you would like to see in the application and I will add that to To-do list. Congrats for the graphics work on new game Albert. My pleasure... I will be more than happy to know that you took time for testing new features. After confirming that it works I can decide on making new features. I prepared beta version to test a new feature for exporting listings in proper format. Atari BASIC, Turbo BASIC XL and Action! are native languages and Atari end-of-line character differs from other platforms. I had to conform to this rule and I made some tests with files. New beta version is here just for testing purposes before I make a final version. Some modules like Graphics editor and Character set editor include support for MAC/65, which is a native assembler. Why I mention this is because every assembler has its rules in source code syntax and MAC/65 is no exception. The code must begin with a line number (or a space? ), following is a space before a label or a mnemonic. Labels have to be uppercase letters. Graphics editor generator now has support for MAC/65 data statement generation (Data values listing example), including an option to add line numbers. Without this option it generates code which puts a space at the start of the line. 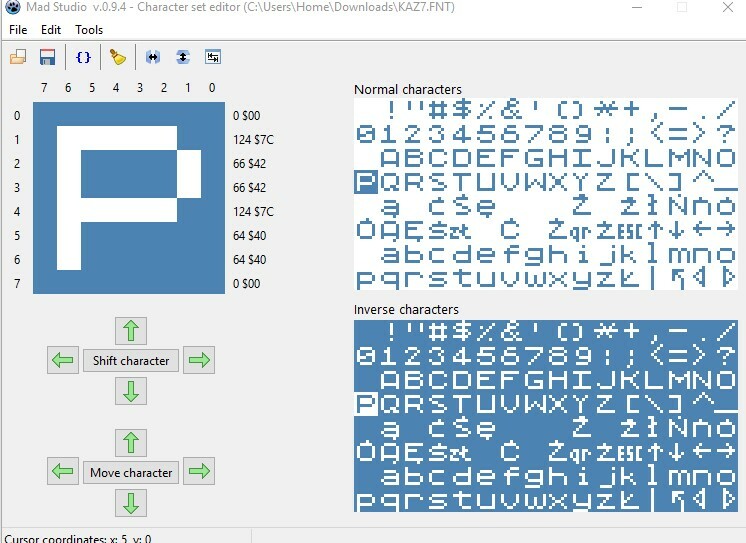 Character set editor generator also has support for MAC/65, but there is no extra space at start of the line (exception is .BYTE declaration - two spaces) and no option for line numbers (it will be there in next version). 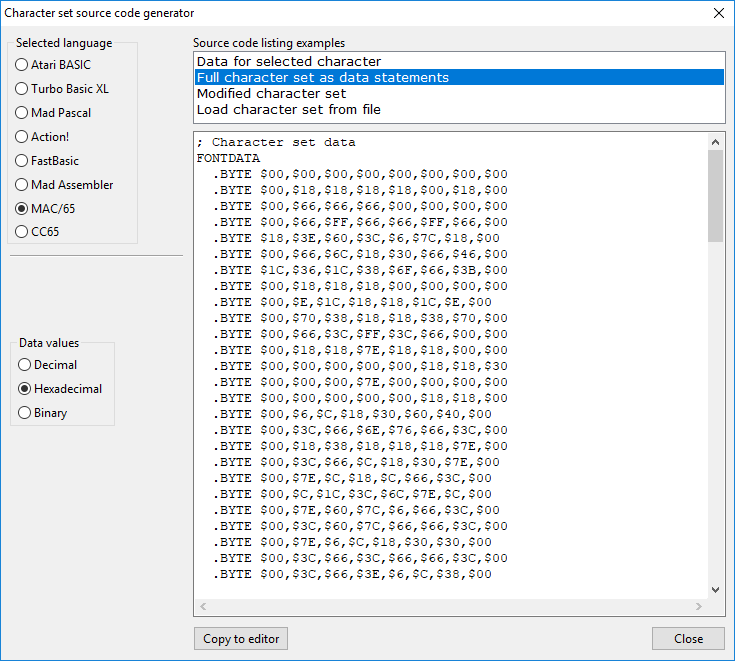 Btw, Character set editor generator also includes automatic generation of full character set as data statements (MAC/65 is supported). So, you have to confirm which version loads successfully into MAC/65 environment. I successfully imported listed Atari BASIC file and run resulting code in native environment (Altirra emulation). I don't use MAC/65 so this is a place where your help is most appreciated. Same issue with an end-of-line matter exists for Action! language, so I fixed this, too. I successfully imported Action! listing into Action! cartridge (Altirra emulation). I suspect the same rule applies for FastBasic native IDE version. Does it? Edited by gorgh, Sat Mar 30, 2019 2:26 PM. I am glad you make use of the tool. I am aware of weaknesses of editors, especially graphics editor, which lacks many of standard functionalities. This will be changed in time, all this is on To-do list. Just post here anything you want to see in the program. Is there a pre-made asm code to insert the code generated by Mad Studio, and then compile it into a xex, and to show the image like Rasta Converter? If so, can you attach them in order to create an Assembler version? (I mean a code ready for compiling with WUDSN-Eclipse). Edited by tane, Mon Apr 1, 2019 11:49 AM. 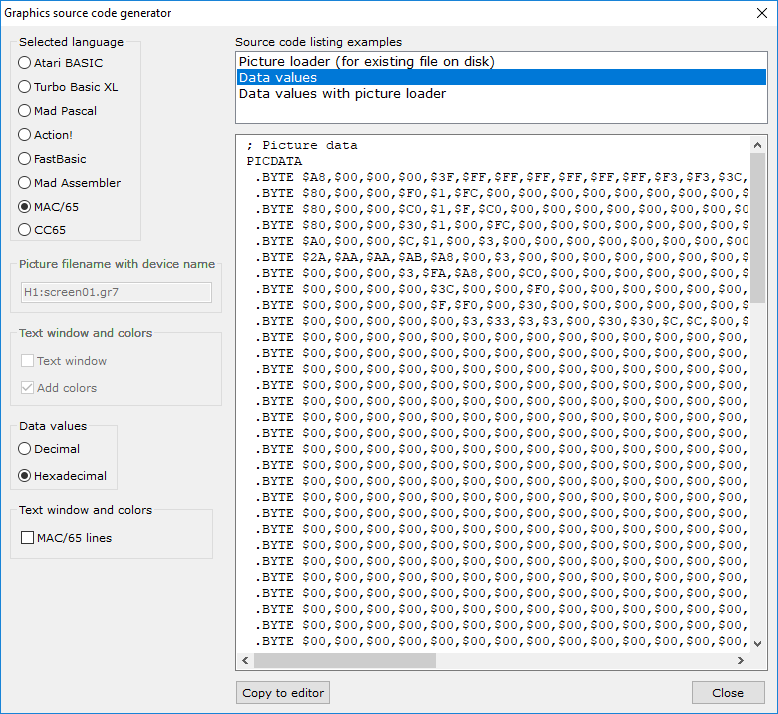 Some assembler code is already available with examples for data statement generation. Try code for Mad Assembler, which is probably what you want to use. Also, post 136 shows some possible examples with MAC/65, but I am not 100% sure which way is correct, because native assemblers have their own rules with code syntax. I am still waiting for user response on mentioned post, so I will know which way is correct for specific assembler. With your help and right direction I can include code for SynAssembler and others. Edited by Gury, Tue Apr 2, 2019 2:07 AM. Thanks. What I'm trying to do, is to find an easy way to convert an image from Mad Studio, exported to an asm like this example: image.asm 19.15KB 4 downloads, to an executable xex using WUDSN IDE. So it's required to add a small part of heading in the code for a proper compilation (maybe Mad Studio could have that option in the future). It's an idea similar to the RastaConverter, but with Mad Studio you have the ability to retouch images with its graphics editor, so it's possible to have better customs images. Hi Gury, my friend! I'm also using your tool recently. I noticed today, when working on game jam, that player data in the player/missile editor saves 23th row only... when I use 24 or more (there are 30 max). Now that bug is removed. Good luck with your current and further projects. Another bug: Mad Studio switches the normal/inverse fields after saving the font set. Yes, Sir, good find. Nearly finished with fixes and other features. I will continue in the evening after I am back from work.